It’s a Girl! 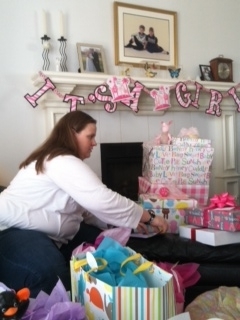 My Niece Katie is going to have a baby, so I’m going to be a Great Aunt! I’m happy to get back to blogging. Several things have happened in the last two years that slowed me down from writing (job changes, long hours), or kept me from being in the frame of mind to write (my beloved Uncle Mike and Uncle Larry both passed away within six months of each other) or in the big scheme of things writing a blog was just not as important as day-to-day life and living. The biggest and saddest thing that happened was losing my beloved brother Tim, who passed away on January 15, 2013. He loved my blog, he loved reading about the adventures I wrote about his children (Ian and Elyse) and his nephew and niece (Nick and Katie). He was my first email subscriber. He would make comments on my posts. I didn’t really want to continue without one of my biggest fans. But I realized today I needed to resume writing this. Because I attended my niece Katie’s baby shower. Yes, I’m going to be a GREAT Aunt! 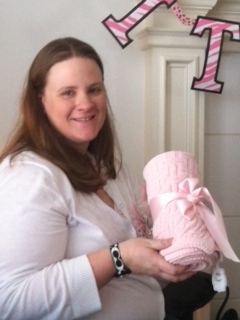 Katie with a pink blanket I gave her for my new great niece. When Katie was born, I gave her a similar pink-crocheted blanket which she still has! Elyse sitting by my side as I was snapping a few pictures of Katie opening her gifts, I promised myself I would come home tonight and write this and commence writing my aunt blog again. Now I have a new little person coming in May to write about, plus I have missed so many stories and accomplishments of my four nephews/nieces I should have been telling. So I will not only be writing a few new stories but going a little into the past as I have done with many of my previous posts to play catch-up on a few items which I hope you’ll enjoy reading about. Regardless, they will give me joy writing about them. I am so happy that you are back writing these blogs. I have missed your writing and story telling.